"Under regular chiropractic care you will have less pain, increased energy, reduced stress and obtain balance in your life." 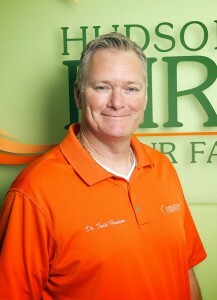 Dr. Todd Hudson is a licensed Chiropractic Physician serving the Sarasota community since 1997. Dr. Hudson is also a local that was born and raised in Sarasota Florida. He grew up the youngest of four children in a family raised on Chiropractic Medicine. Dr. Todd is an avid athlete; he played football and baseball locally both at Sarasota High School and Cardinal Mooney High School before graduating in 1987. Dr. Todd received his Bachelor of Science from Florida Southern College in Sports Management in 1991. Dr. Todd played baseball at Florida Southern as well as playing in Division 2 College World Series. He continued a short career in professional baseball before returning to school to pursue a career in Chiropractic Medicine in which his passion was to help people. He continued his studies at Life University School of Chiropractic receiving his chiropractic degree in the summer of 1997. Shortly after graduation Dr. Todd went to work as a chiropractor in his family's business. Dr. Todd is committed to promoting optimal health and well being for his patients. Throughout his 17 year career he has continued to study and improve his techniques in order to bring his patients the most customized effective treatment. Dr. Todd stated, "I have reaped the benefits of chiropractic care my entire life being raised in a family of chiropractors and I want my patients to experience a lifetime of benefits as well." Dr. Todd believes in incorporating chiropractic and holistic by using a "whole person approach." This approach to wellness means looking for underlying causes of any disturbances or disruption (which may or may not be causing symptoms at the time) and make proper interventions and lifestyle adjustments that optimize the conditions for normal function. By using this unique approach, Dr. Todd is able to help you accelerate and/or maintain your journey to good health. Dr. Todd is passionate about every type of sport. Many Sunday afternoons you can find Dr. Todd on a softball field or a golf course participating in two of his great passions. Dr. Todd is the father of two boys Blaine (19) and Riley (3). He and his wife Jennifer keep busy with their son Riley hiking through some of Sarasota's local nature trails or simply playing at the many great parks Sarasota has to offer.